The Sendix F5868 and F5888 sensors by Kuebler (Germany) are gearless optical encoders based on the patented Intelligent-Scan-Technology. 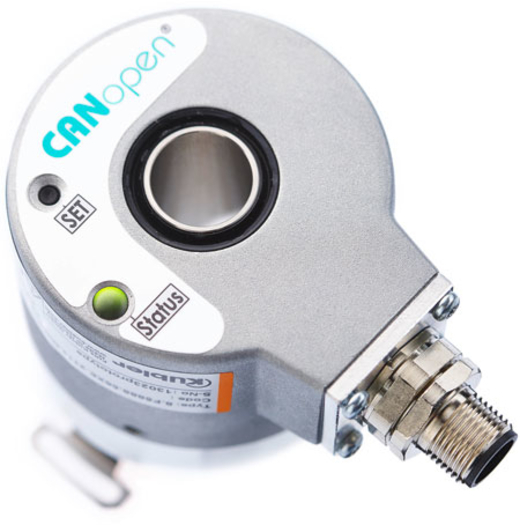 The CANopen-connectable multi-turn encoders are available as hollow-shaft version (up to 15 mm). THE USED THE OPTOASIC MAKES THESE ENCODERS insensitive to magnetic fields. The CANopen interface is compliant to the CiA 301 (version 4.2) specification and the CiA 406 profile for encoders. With the multi-turn and single-turn resolution of 16 bit, the products achieve an overall resolution of 32 bit. The devices come in 58-mm housings. The provided through hollow-shaft allows several possibilities for other motor options located behind the encoder. The multi-turn encoders also feature the Universal Scaling Function (USF). The USF function prevents the occurrence of an error at the end of the physical resolution of an encoder when a scale factor is active. In such a case, it may happen that the division of the physical limit by the programmable total resolution results in a figure that is not an integer. The USF function corrects automatically this error in the encoder when the end of the measuring range is reached. This way, no measuring error can occur in case of endless boom rotation in both directions. The encoders of the F58 series are used for example for measuring the rotation angle of booms or upper structures mounted on vehicles. Typical applications may be found for example in the mobile machine sector, but these encoders can be used also in other applications requiring CANopen communication.